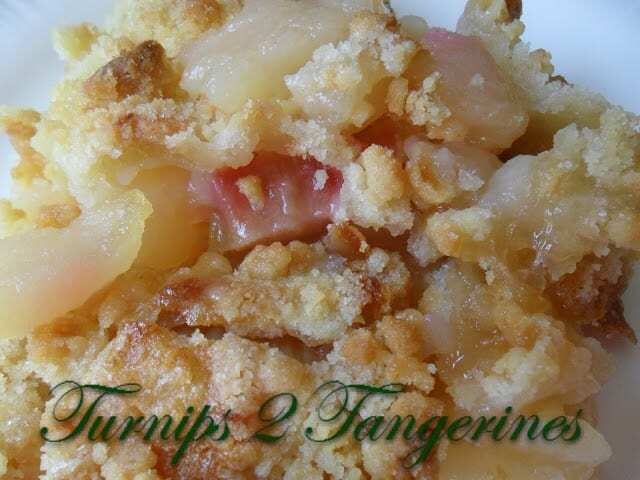 Apples and Rhubarb go together wonderfully in this easy recipe for Apple Rhubarb Crisp. 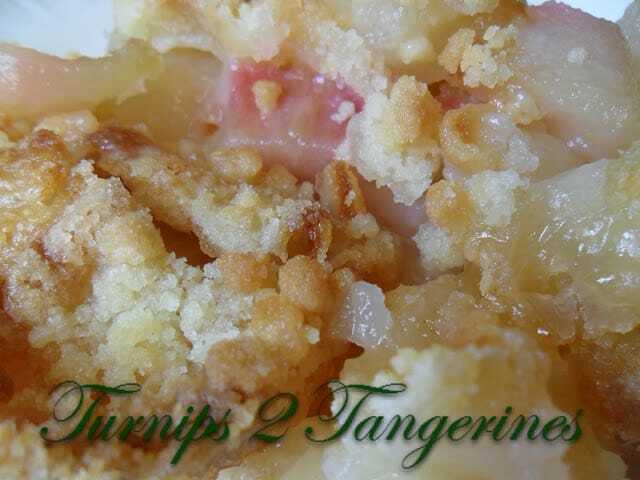 Apples offer the sweetness in this recipe and rhubarb adds the tart. Together the end result is just right. 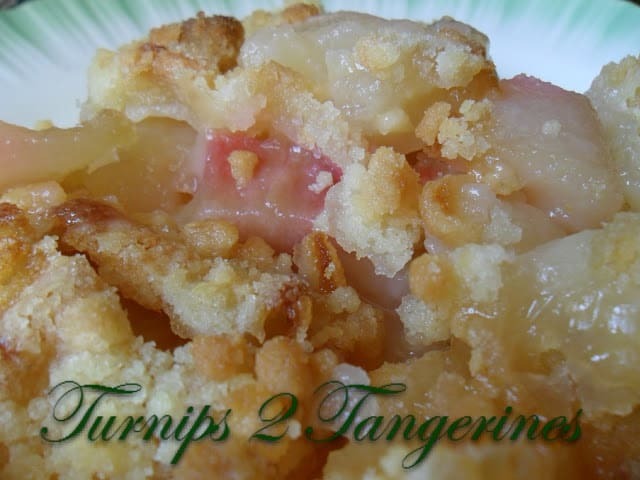 Over the years, rhubarb has become known as the “fruit” that goes with everything. Apple-Rhubarb, Strawberry-Rhubarb, Mixed Berries-Rhubarb, Cranberry-Rhubarb, Ginger-Rhubarb, this list can and should go on and on. Rhubarb [ROO-bahrb] The thick celerylike stalks of this buckwheat family member can reach up to two feet long. They’re the only edible portion of the plant. The leaves contain oxalic acid and can therefore be toxic. Though rhubarb is generally eaten as a fruit, it’s botanically a vegetable. Highly perishable, fresh rhubarb should be refrigerated, tightly wrapped in a plastic bag for up to 3 days. Toss the apples and rhubarb with sugar, 1/4 cup flour, cinnamon and apple pie spice. Mix the flour, rolled oats, brown sugar, cinnamon, pecans, and melted butter in a medium bowl. Place apple mixture in an 8 x 8 inch baking dish. Sprinkle topping mixture on top. Easy Caramel Apples are super easy and oh so good! This is a beautiful fall crisp, great flavors. Thank you so much for sharing with Full Plate Thursday and hope you are having a great weekend! Apples and rhubarb go so well together. Thanks for sharing! Looks good! apple is one of my favorite! Hi Lynn, that's look very inviting and delightful. Love apple with cinnamon, the best combination. Thanks for sharing your recipe, it look really good. 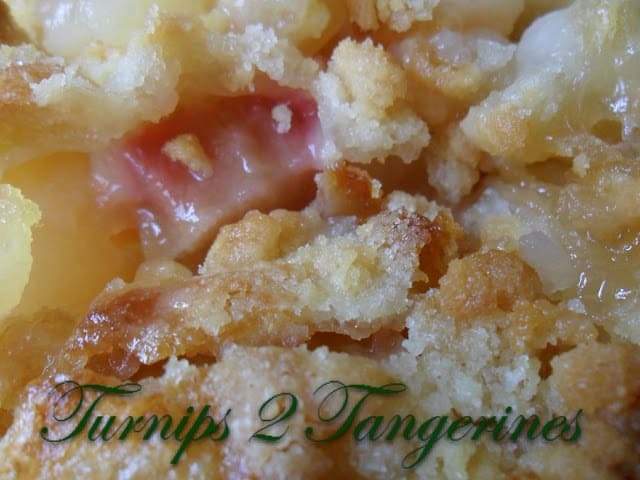 Thanks for linking up this delicious recipe at my Sweet Wednesday Link Party, it looks so good! Hi Lynn. Welcome to Share A Sale, I love them and their many affiliate programs!